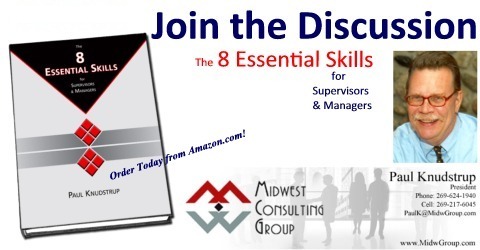 The 8 Essential Skills | Ideas from the Book! The 2018 version of the ONEplace Nonprofit Leader Academy (ONLA) is underway, with a great group of 19 participants. This marks the 7th year of this superb development program for nonprofit leaders. Like all the services at ONEplace, the Academy is provided free of charge to the nonprofit community in Kalamazoo County, thanks to the generosity of local foundations. Prior to the initial group session we used a pair of 360 feedback assessments to gather a wealth of data on how each participant is perceived by their managers, employees, peers, and key others. The feedback is anonymous and completely confidential; the results are given only to the individual Academy participant. They’ll receive their feedback reports at the March session. This year’s Academy is already turning out to be exciting, innovative, and a great professional development experience for the participants. It’s also a real pleasure for those of us involved in the Academy as instructors, panelists, mentors, and presenters. The Academy meets one day a month from February through June, then takes a break until late August when the monthly sessions begin again. The Academy concludes in November, and then the 2019 application process begins. Stay tuned for more on the Academy. In the meantime, take a few minutes to check things out at ONEplace@kpl.gov. Director Matt Lechel and Associate Ragan Savara provide a full range of programs and services to nonprofit leaders, staff, volunteers, and boards. So if you work for or are involved with a nonprofit in the region, look to ONEplace for knowledge, information, and support. They’ve been making a huge difference in our community since 2011!